Why Is It So Important to Intervene in a Child’s Substance Abuse? Whether you are a biological parent or guardian of a child, you have probably gone to great lengths to protect that young person from illness and injury. Yet having a child succumb to the disease of addiction can still come as a shock, leaving families unprepared for the consequences. Parents often find that they blame themselves or each other for a child’s substance abuse, or that they resent their teenager for getting involved with a “bad” crowd of kids or for disobeying household rules. According to the University of Utah’s Genetic Science Learning Center, our genes have a powerful influence on the way we respond to drugs or alcohol. However, addiction ultimately occurs as a result of a complex interplay between genetic, environmental, and social factors. A child’s home environment, their peer group, stress at school or in social settings, psychological health, and many other factors can increase their vulnerability to substance abuse. In order to address the problem of addiction, parents must avoid pointing fingers at one or two members of the household and approach substance abuse as a disease of the brain that both arises from and affects the entire family unit. The use of club drugs like ecstasy, inhalants, and hallucinogenic substances like LSD is also on a downward cycle among teens. While marijuana use in general has declined among 10th, 11th, and 12th graders, students who responded to the Monitoring the Future survey revealed greater acceptance of the use of marijuana, both as a recreational and medical substance. They also indicated that they believed the use of both natural and synthetic marijuana products was relatively safe. The incidence of opioid abuse, which has reached epidemic levels among older adults, has also decreased among middle school and high school students. The recreational use of prescription pain medications among teenagers, which was at a prevalence of 9.2 percent in 2009, has now declined to 4.8 percent, according to the survey. But because prescription narcotics are widely prescribed and commercially produced in pharmaceutical laboratories, many teens perceive them as safer than street drugs — a dangerous misconception that can lead to abuse of these medications, overdose, and death. Even though substance abuse among adolescents in the US is on the decline, many families are struggling with the consequences of addiction. In order to confront this disease, parents must accept that addiction is not an individual problem but an indication of dysfunction in the way family members relate to each other and communicate their feelings and expectations. When treating adolescents with substance use disorders, therapists address these problems by working with every member of the household, both in individual sessions and together in group counseling sessions. Over time, medical research has shown that the social stigma of addiction is based not on facts but on misconceptions of the nature of substance abuse. Research from the National Institute on Drug Abuse confirms that addiction is a disease that arises from the brain’s response to intoxicating drugs. In the medical community, addiction is now viewed as a chronic condition that is comparable to diabetes, heart disease, or cancer in that it involves cycles of relapse and recovery, and requires continuous symptom management to maintain a state of health. Addiction happens because of a lack of willpower or self-discipline. Addiction occurs as a result of chemical changes in the brain caused by drugs or alcohol. Only children who have no talents or academic potential become addicted to alcohol or drugs. Substance abuse affects children of all abilities, from high achievers to kids with more moderate gifts. Only kids from impoverished backgrounds get involved with drugs or alcohol. Substance abuse affects children from all socioeconomic groups. A relapse back into drug or alcohol use means that rehab has failed. Addiction is characterized by relapses, and many people experience multiple relapses before they achieve long-term abstinence. Once a young person gets involved with drugs or alcohol, they will never succeed in life. Many young people have built happy, fulfilling lives after being treated for substance abuse. Addiction will inevitably destroy a family. With the right support from therapists and addiction professionals, families can strengthen their bonds through substance abuse treatment. Feelings of shame, disappointment, frustration, and even anger are common in parents who discover that a child is addicted to drugs or alcohol. These responses are natural and should not be ignored; however, communicating these feelings to a child or teenager in the form of accusations, judgments, or criticism will not help the healing process. When you’re talking to a child or teenager about substance abuse, try to choose words that do not reflect anger or judgment. For example, if your child has a friend who abuses drugs, don’t refer to that person as a “druggie” or “junkie.” These judgmental words will make your child defensive. Your tone of voice can also make a difference in how your son or daughter responds to your talk. Kids may be young, but they are highly attuned to the way their parents speak to them. Hints of condescension, judgment, sarcasm, or resentment will quickly come through and may destroy the connection that you’re trying to build in this discussion. Ultimately, talking with a child about addiction is about trying to find common ground to build a connection. Your goal is not to criticize your child’s behavior, but to help them recognize that there is a direct link between substance abuse and negative consequences, such as problems in school, difficulty learning, loss of friends, or loss of a part-time job. Even more importantly, a nonjudgmental approach will help parents learn more about their children, discover their hopes and fears for the future, and possibly find ways to establish stronger bonds with their kids. In our culture, substance abuse and public intoxication are frowned upon, yet at the same time, drinking alcohol and experimenting with drugs or alcohol are seen as rites of passage for young people. The parents of a high school boy who binge drinks on weekends might excuse his behavior by saying, “He’s just sowing some wild oats.” The overindulgent stepfather of a teenage girl who finds out that his stepdaughter is taking drugs might shrug and say, “She’s just blowing off steam. School is stressful for her.” These kinds of excuses may smooth over potential arguments in the short-term, but ultimately, they will only teach a child how to escape from stressful situations without accepting responsibility. Repeated abuse of alcohol can harm the developing adolescent brain, resulting in memory problems, a shortened attention span, poor judgment, and poor academic performance. According to Merck Manual, alcohol abuse in young people also increases the risk of developing mood disorders or worsening the symptoms of psychological conditions that already exist. Alcohol and drug abuse also increases the risk of depressive thoughts, suicide attempts, and suicide. In children and teens, substance abuse may point to an underlying psychological disorder that can be diagnosed and treated with professional help. 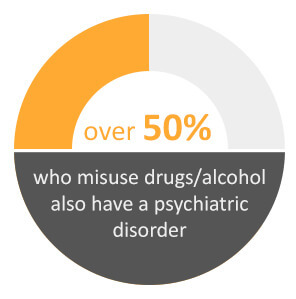 The National Alliance on Mental Illness (NAMI) estimates that over 50 percent of young people who misuse drugs or alcohol also have psychiatric disorder. In fact, the coexistence of mental health and substance use disorders — a condition known as a dual diagnosis — is so common that clinicians now anticipate that they will find it when they counsel a young client, NAMI states. Adults taking care of children or teenagers must be aware that substance abuse is not the sign of a lack of self-control or weak character, but a brain disorder that may coexist with other psychological disorders. Mental illness is extremely common in the US among people of all ages. 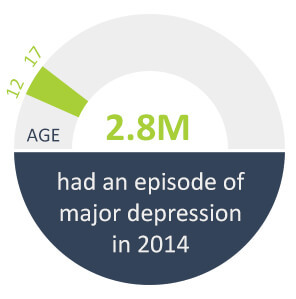 The Substance Abuse and Mental Health Services Administration (SAMHSA) states that in 2014 alone, 2.8 million teens between the ages of 12 and 17 had an episode of major depression. Getting the right treatment for co-occurring disorders is crucial, especially when psychological symptoms are accompanied by signs of substance abuse. Kids who have a dual diagnosis of substance abuse and a psychiatric condition need a rehab program that treats both disorders at the same time; otherwise, treatment is unlikely to lead to long-term abstinence. Along with individual and group therapy, treatment may include pharmacological measures to address symptoms of depression, anxiety, attention deficits, or lack of impulse control.